This fine and impressive vintage blue sapphire and diamond ring has been crafted in 18 ct white gold. The pierced decorated setting is ornamented with a feature 1.06 ct oval mixed cut blue sapphire four claw set in relief to the centre. The sapphire is flanked on either side by a total of six tapered baguette cut diamonds, collet set within flared settings. The ring is hallmarked to the interior of the shank with the mark for 18 ct gold (18k). 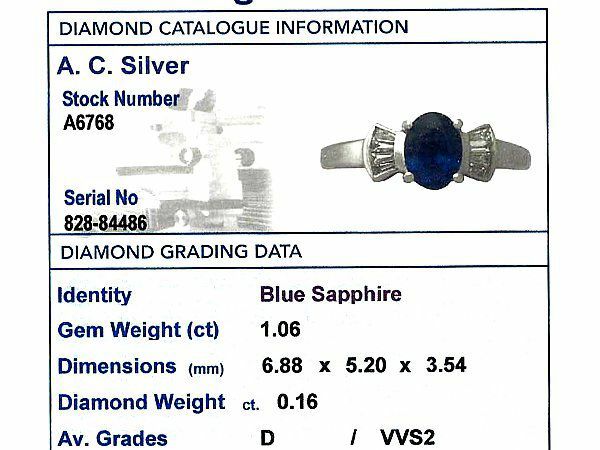 This vintage 1990's dress ring is supplied with an independent diamond grading report card. This impressive gemstone dress ring is fine quality set with a blue sapphire and very well colour matched, very high colour and clarity graded diamonds.